Both operations can be performed manually in your on premise AD administration console, and in the Azure AD administration console in Office 365. However, when you're dealing with a moderate to large number of users its often in practical to use the administration console GUIs for either step. In this post I'll talk about how you can use PowerShell to activate Office 365 users once they're synchronized to Azure AD. We'll begin by connecting to your Office 365 tenant. 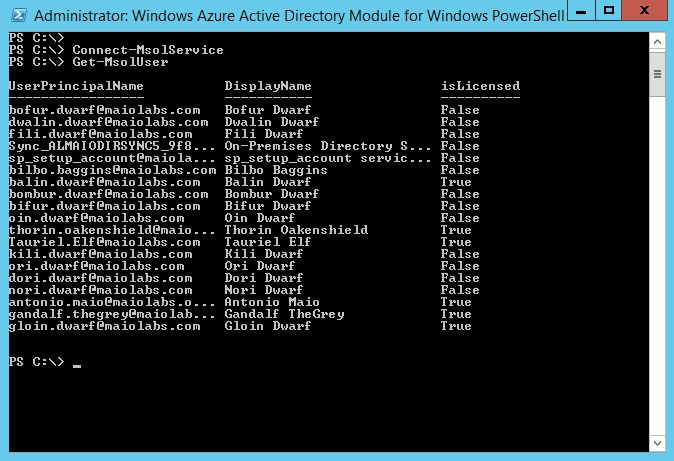 Launch Windows Azure Active Directory Module for Windows PowerShell. Ensure you launch it as an Administrator. 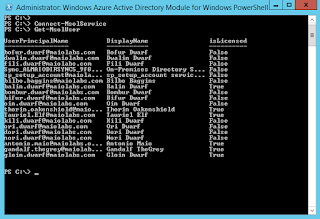 Connect to your Office 365 tenant by using Connect-MsolService. This command does not take any parameters. 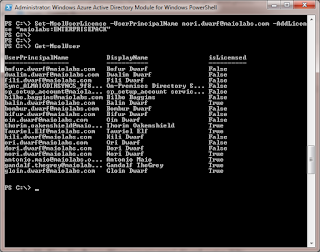 To view the list of available PowerShell commands with this module type Get-Command -Module MSOnline. If you only wish to see a list of unlicensed users then you can call the same command with a parameter for unlicensed users only: Get-MsolUser -UnlicensedUsersOnly. If you are working with a large number of users, consider using the -MaxResults parameter along with the -UnlicensedUsersOnly parameter. For example, you can call: Get-Msoluser -UnlicensedUsersOnly -MaxResults 1000. If -MaxResults is not specified, a default value of 500 is used. Before you can activate Office 365 users, we must first set the location of each user. Microsoft requires this because the services it can offer to users is based on their location. The 2 character country code is used to set a location for each user. So for Canada you use "CA" and for the United States you use "US". Other applicable country codes can be found here: two letter ISO code list. You can set the location for an Office 365 user by calling: Set-MsolUser -UserPrincipalName "<user's upn>" -UsageLocation "US". 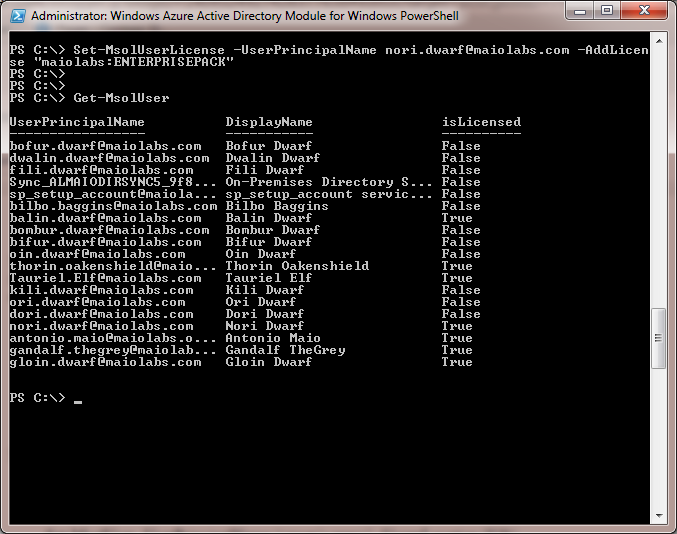 Here we specify the user by specifying their UPN by using the -UserPrincipalName parameter. Notice, the number of active units (available licenses), warning units and consumed units (assigned licenses) are displayed. The number of licenses available to you will be Active - Warning - Consumed. So in my case I have 19 licenses available that I can assign. 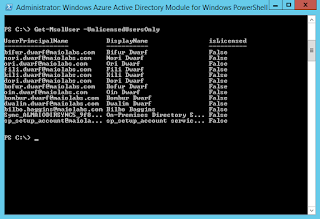 Get-MsolUser -UnlicensedUsersOnly | Set-MsolUser -UsageLocation "US"
Get-MsolUser -UnlicensedUsersOnly | Set-MsolUserLicense -AddLicenses "<your license sku>"
Azure ADConnect provides a fantastic tool for synchronizing users from on premise Active Directory to Office 365 and keeping them synchronized. 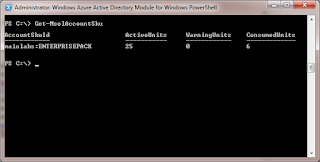 However, activating users is still a critical step in enabling users to access Office 365 services, and when activating users in bulk using PowerShell will save considerable time over using the administration console GUI. Thank you for discussing 2 critical steps in the process. LucidTechSystems is one of best Hadoop and Big data training institute in Hyderabad. Really informative article and thanks for sharing experience with us. Actually, I found this much informative, actually I am searching Python Job Support but your post gave me new direction. Thanks, Keep it up.